Comments: A friend of the Rebel Alliance, Yoda trains Luke Skywalker to be a Jedi Knight. Hiding from the evil Empire on the planet Dagobah, Yoda teaches Luke to use the power of the Force. He wants Luke to be strong enough to fight Darth Vader, who is a powerful leader of the Empire. Yoda tries to teach Luke all the skills he will need for the coming battles. 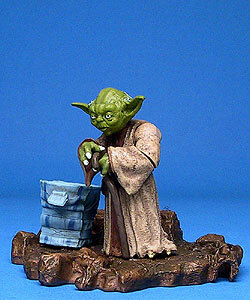 While this Yoda figure does not include any other title description, it is part of the Dagobah-themed wave and therefore is listed that way in our archives. Detach upper body and combine with Luke Skywalker OTC #1 figure to recreate the Dagobah movie scenes!